Hello people of the light, how are you? I am fine. I shake my head, how does one blog totally honestly, intimately; knowing intimacy has no integrity on the Internet. It’s a form of thought promotion. And yet in writing books, stories, novels, songs there is no false idea or hiding of the truth, because, speaking for myself, art is an honest search for the truth. Art could be an abstract audit of the balancing act between one’s heart, soul, intellect and spirit. An intimate engagement between our sinuous supports, like an eternal yoga position. One can’t have integrity if there is a conscious omission of an article of truth that would move the story along in a different direction, a more honest direction. But life itself has integrity, and always eventually exposes all things. I’m looking through my “musical” notebook, the one I bring into my son’s kindergarten class every Thursday morning, because we are writing a fascinating musical together. Talk about integrity. The children are the most inspiring writing partners I’ve had so far, I walk on air out of the classroom, and can’t wait to walk into the classroom. And in the notebook I see other notes; Religion sensitizes us to feel we don’t belong. Radical aloneness. Prayer is how we understand Gd. Become a thought of Gd. Risk=to save yourself, don’t wait to be saved. These are shorthand thoughts inspired by Heschel in a study group I joined with Rabbi Jan Uhrbach. And listening to the poet David Whyte, similar revelations, like being out of it, feeling homeless in the world, are not just passing feelings, but facts. Don’t try to make it fit, or fix it, or smooth it over. “God is an alien”, Dashiell said. If we have Gd inside of us, if we come from Gd, then how can we be totally at home and at one on this planet with other outcasts as unique as each one of us is? I’ve gotten in touch with my radical aloneness lately. Not that I want it to be a comfort. It’s unbearably raw. But I don’t want to avoid it. I wonder if it’s akin to being able to die while being alive. I also wrote, in this wonderful orange notebook of the magical musical, “intimacy, integrity and irrational behavior. Mother. Myself. Then I started a song. Thankfully, the songs still are the thing, they sing through me, my murky pond bottom, and clear a path toward my enlightenment. I’ll start recording here in this apartment in May or June, and will upload the bits, do some local shows, as far as I know, and record more in August, up load the bits, do some local shows, as far as I know, and have scintillating plans, truly, for reaching you out there with something so new, so roots, so mysterious to me, and yet I have plans of how to capture it. That’s the unicorn in me. We all have one. Catch a glimpse of your unicorn and chase it through your woods forever. I quickly want to mention how much I loved doing the show in Connecticut, I played some classic songs like “Let it Be” and “Lola”, “I can’t get no satisfaction”, “Whole Lotta Love”, “Proud Mary” and of course some Janis Joplin along with my Sophie songs. Why did I wait so long to become selfish, and use those stories for my pleasure? Also, at the Love Heals benefit, Hilary Clinton wrote a letter for Bronson Van Wyck in lieu of presenting him an honor, and I have to say this; if Hilary runs again, her whole campaign should be the way that letter was written. From the mother. The mother of the planet. She is a great mother, and anyone who has children can agree that being a great mother is the toughest job. So there. This planet needs a great mother. I could write more about the progress of the book etc., but time being the youth which only the young get to squander, I better play a few bars, write a few words, before I’m carried off by dreams. Honesty is like walking; we can only move ahead one step at a a time. And the journey our steps take us on may bet be to the destination we initially supposed. 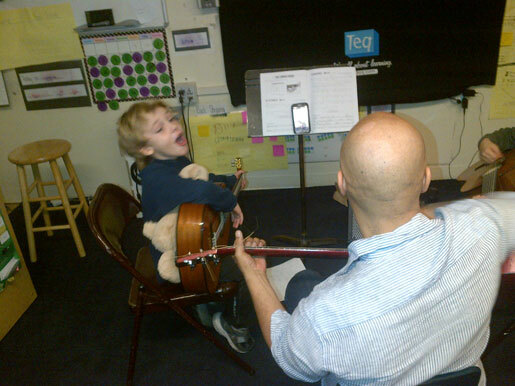 Love that Dash is already creating and feeling his way on the guitar. I want to see/hear their musical. Is he still interested in playing violin? Sophie, I LOOVE your posts. At first they scratch at me, help me sand down a little further into myself. Your words have a way in with me. I take them in. Why? Because you are the greatest inspiration I have or will allow and that is true. I don’t know why. I didn’t consciously choose you or any of this so I feel I can trust it now. It lingers.